Want to make a vegetarian dish with an eye-catching presentation? This is the one! My past attempts at making quinoa tasted kind of bitter, leaving me indifferent to the high-in-protein grain that I keep hearing about. This time I followed instructions and rinsed the quinoa. Was that an important step? I'll be doing that from now on since it tasted good (though I'll need to remember to get the fine mesh strainer for all those itty bitty grains). I used a Taiwanese Pumpkin from my parents' garden here. 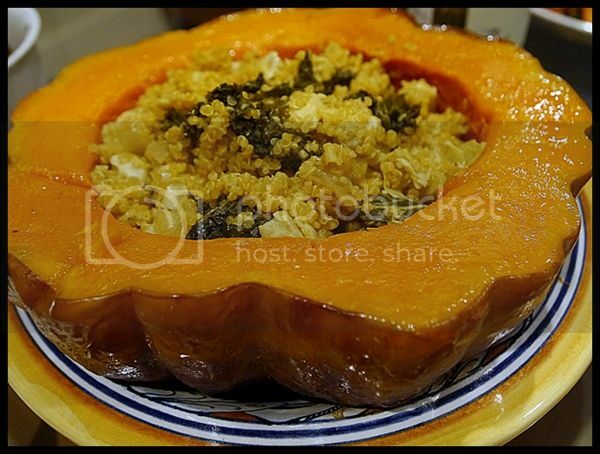 It looks and behaves like a Kabocha Squash but my parents say the Taiwan Pumpkin is a different vegetable. For the winter greens, I used kale. You could also use chard, collard greens, rapini, mustard greens, or turnip greens. I increased the amount of artichoke hearts since I like those. I used non-marinated artichoke hearts but you could probably use marinated if you preferred. The original recipe includes instructions for making an anchoïade (an anchovy dressing) but I left that out since I was making a vegetarian meal for friends. I think even the meat eaters in our group found this to be a satisfying dish. Thanks to my sister for sending another great recipe my way! 3. Add a healthy drizzle of olive oil to a large saucepan or dutch oven over medium high heat. Add onions and garlic and let cook for a minute until soft and translucent. Add the greens and the artichokes and mix to combine, cooking for another minute until they begin to wilt. Add the stock, the quinoa, and a hearty pinch of salt and bring to a boil. Lower the heat to a simmer. Cover and cook for about 15 minutes until all of the liquid is absorbed (but the quinoa is still wet) and the germs have begun to spiral. Turn off the heat, place a dry paper towel between the pot and the lid, and let sit for at least 5 minutes. Fluff with a fork and season with salt and pepper before serving. 4. 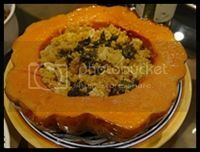 To serve, scoop quinoa mixture into the kabocha halves. Looks yum! I will have to give it ago, although I don't think I could get hold of a pumpkin at this time of year? Depending on where you are you should be able to find some hard-skinned winter squash like acorn, kabocha, red kuri, ro hubbard. This should work with any of them, I bet. Thanks for the suggestions! I rarely see squashes here outside of autumn, but perhaps I need to venture beyond the mainstream supermarkets?